RIM has officially announced the BBM Music app and will be available for Canada, the United States and Australia. The service will be offered through a premium and a free subscription option. PREMIUM SUBSCRIPTION: The Premium ‘full track’ BBM Music experience is available for a monthly subscription of $4.99 USD ($4.99 CDN and $5.99 AUD). The Premium version will feature a free Premium trial offer. Free Premium trial offer*: With the free Premium trial offer, you can use all the features of a Premium subscription for a limited time. Get up to 2 months* free in US and Canada, and one month free in Australia. FREE SUBSCRIPTION: There will also be a Free subscription to the service that delivers the same social experience as the Premium subscription, but with 30 second song previews versus full song tracks. After your Free Premium trial offer period ends, you can opt to continue using BBM Music without a paid subscription by using this Free subscription. You can upgrade from a Free subscription to a Premium subscription at any time. With your BBM Music profile, you can choose up to 50 songs from the BBM catalogue. You can further add more music to your library by adding friends and get access to your BBM friends’ music profile songs. 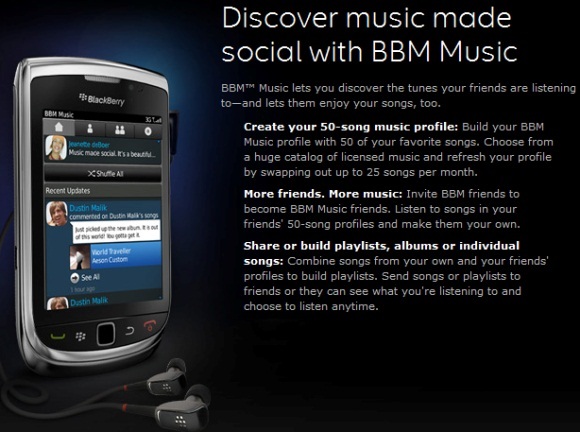 So suppose you have 10 BBM friends with BBM Music subscriptions, and they each have 50 songs in their music profiles. From those friends alone, plus the 50 songs you downloaded to start your profile, you now have access to 550 songs. You can also turn your friend into a playlist, sounds neat. The BBM Music service will be available in other regions soon, and we hope India is in the list. Stay tuned for more.